"The 3 Euphonium Mouthpiece Placements"
There are three euphonium mouthpiece placements. All are correct, you just have to use the one that is correct for you. 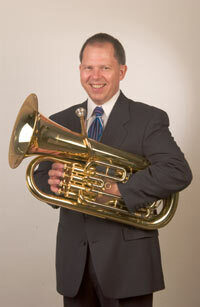 Most euphonium players naturally find the right one, but sometimes they are told to use the wrong one. Teachers tend to think theirs is the only one, which is easy to understand because that's what they know works for them. Just because a famous euphonium player has a particular placement doesn't make it common or the one for you. Check and see which one you have. You can usually tell quickly. Your goal is to sing the sound in your mind and have it come out of your horn. To me, brass playing is a substitute for singing, using your horn in place of your voice. I find that this applies equally to euphonium and tuba as well as trombone.